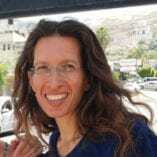 Shiri Barr (50) studied at the Arava Institute in Fall 2002 and today lives in Haifa with her partner. I arrived at the Arava Institute in the fall of 2002, pretty much straight from the airport, after six years in Australia. Officially I came only to complete my Bachelor’s degree, but in reality the Institute served as an important milestone for me to return to life in Israel, and even more so into the environmental movement and the peace movement. In Australia, I studied Applied Social Ecology, or as I call it affectionately, pursued a degree in tikkun olam (healing the world). We were invited on a daily basis to explore what social or environmental purpose we would devote our lives to in order to increase the good in the world. I was “called” to return to Israel and work to promote peace – and I had no idea what that was. Life at the Institute during the Second Intifada, together with Palestinian-Israelis, was a formative experience. The closeness allowed me to see for the first time in my life how things looked from the point of view of the “other.” Unconsciously, the commitment to be an ally to Palestinians, and to listen rather than to speak, began to form within me. Over the years, this commitment has become a way of life and a guideline for my professional activities. Today I lead the Mind the Conflict Center, which specializes in working with conflicts in different areas of life. The Center develops unique models for working on conflicts and disagreements based on a combination of mindfulness and conflict resolution. I obtained my Master’s degree in Conflict Transformation and Peace-building in Vermont, at a small institute with students from 34 countries. Each of us brought their “domestic conflict” and together we learned about possibilities for solution and transformation. A few months after my return to Israel, the Operation Cast Lead war broke out in Gaza and changed the situation again. I organized a quiet protest march with partners in the streets of Tel Aviv, and experienced the ability of the “silent crowd” to close their hearts to the plight of the Palestinians – just as is happening today. This is how I understood that one of the main obstacles to progress towards justice and reconciliation are the psychological barriers to conflict resolution, which in effect do not allow people to hear and/or believe what the other side says. Today I specialize in translating the vast academic knowledge existing in the field of conflict resolution into practical tools to overcome these barriers. Mind the Conflict is a unique work model that we developed at the Center. The model trains people to switch from automatic behavior in situations of conflict and disagreement, which usually leads to escalation and increased violence, to conscious behavior leading to the creation of understandings and agreements, and to improving relationships and finding constructive solutions to disputes. In recent years we have been working mainly in the public education system, and are now beginning to work in the field of dialogue between groups in conflict. At the same time, I am involved in solidarity with Palestinians. The close ties I have established with several families in the West Bank allow me to get to know the reality of life beyond the Green Line, and bring it to the attention of more Israelis. We also provide practical assistance wherever possible – from accompanying people to hospitals and courts, to guarding farmland, and fundraising for students.